Editor’s Note: The post below comes to us from Kendall Curlee, director of communications at the University of Arkansas Honors College. FAYETTEVILLE, Ark. — A University of Arkansas research team has published a paper in ChemBioChem, a top European journal of chemical biology, based on groundbreaking experiments led by undergraduate honors student Armin Mortazavi. The paper contributes to the understanding of the molecular properties of membrane proteins, which play critical roles in cell signaling, both for diseased states and basic biological functions. “It could be useful in understanding how proteins aggregate, which is characteristic of some neurodegenerative diseases like Alzheimer’s or Parkinson’s – but that’s long down the line at this point,” Mortazavi said. 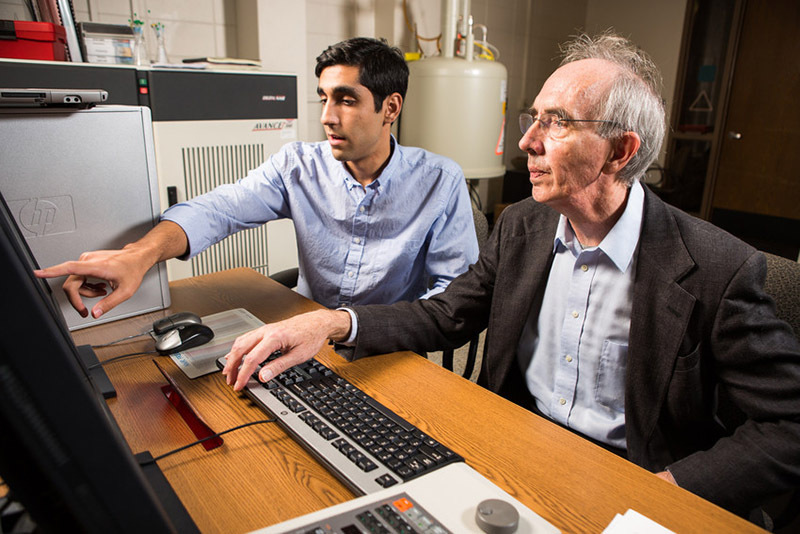 Armin Mortazavi and faculty mentor Roger Koeppe examine deuterium magnetic resonance (NMR) results. Photo: Matt Reynolds. Mortazavi, from Hot Springs, is an honors chemistry and physics double major, a Bodenhamer Fellow, and the recipient of the Goldwater Scholarship. He is listed as first author on the article, giving him primary credit for performing the experiments that led to the discoveries. Roger Koeppe, Distinguished Professor of chemistry and biochemistry in the J. William Fulbright College of Arts and Sciences, is Mortazavi’s faculty mentor and director of the study. The paper is titled “Juxta-Terminal Helix Unwinding as a Stabilizing Factor to Modulate the Dynamics of Transmembrane Helices.” The U of A team used nuclear magnetic resonance spectroscopy to alter the amino acid sequences of model peptides and incorporated deuterium labels to study how the peptides move within a model for the outer membrane of a cell. Mortazavi’s research builds on earlier work by honors student Kelsey Sparks, who studied the role aromatic rings play in the movement of the same family of peptides. Sparks was the first author on a paper published in 2014 in Biochemistry and is a coauthor on this paper. Previous work in Koeppe’s lab found that a similar peptide helix might be unwound or “frayed” at the end. Mortazavi has confirmed that there are multiple peptides that fray at the end, limiting their extent of motion and helping to anchor them within a lipid membrane. Mortazavi presented his work at the 2015 meeting of the Biophysical Society and will present his latest results at the February 2016 meeting in Los Angeles. Koeppe has mentored more than 25 honors students, with six of them publishing their research. Mortazavi’s work has been supported by a State Undergraduate Research Fellowship and Honors College research and travel grants. Other members of the research team who are coauthors on the article are graduate student Venkatesan Rajagopalan and research associate professor Denise V. Greathouse. About the Honors College: The University of Arkansas Honors College was established in 2002 and unites the university’s top undergraduate students and professors in a learning environment characterized by discovery, creativity and service. Each year the Honors College awards up to 90 freshman fellowships that provide $70,000 over four years, and more than $1 million in undergraduate research and study abroad grants. 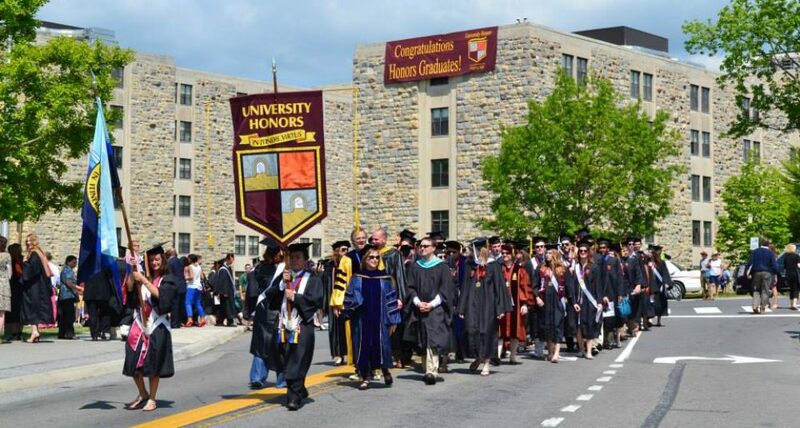 The Honors College is nationally recognized for the high caliber of students it admits and graduates. Honors students enjoy small, in-depth classes, and programs are offered in all disciplines, tailored to students’ academic interests, with interdisciplinary collaborations encouraged. Fifty percent of Honors College graduates have studied abroad – three times the national average – and one hundred percent of Honors College graduates have engaged in mentored research. This entry was posted in Honors News, Honors Research and tagged Arkansas Honors College, Armin Mortazavi, Kendall Curlee, Roger Koeppe, undergraduate research, University of Arkansas by Honorsadmin. Bookmark the permalink.